Troposphere: Contains about 80% of the atmosphere and almost all the water vapour and cloud. That part of the atmosphere where temperature decreases as we go higher. It is terminated at the ‘tropopause’ where temperature ceases to decline as we go higher and begins to increase driven by reception of energising short wave radiation from the sun. In the tropics the tropopause lies at about 100hPa. Hectopascals: is a measure of atmospheric pressure equivalent to millibars. The air pressure at the surface is 1000hPa or 1000mb or 100kPa or 1 Bar. This is a useful indication of height with 100hPa at the equator (the tropopause) about 15km in elevation. Stratosphere: Is heated directly by short wave radiation from the sun creating ozone by energising the oxygen molecule. Ozone absorbs short wave UVB from the sun and also radiation from the Earth in turn radiating energy to heat adjacent molecules. Radiation: The only form in which energy can travel through space. The sun is 20 times warmer than the Earth and emits in a wavelength focussed around 0.5 micrometres (symbol ‘µm’, is one millionth of a metre). The Earth emits in a wavelength band focussed on 10 micrometres and this is in the infrared. It is commonly described as ‘outgoing long wave radiation’ or simply OLR. Most of the land is in the northern hemisphere. Eighty one percent of the southern hemisphere is water. The sea is transparent and stores energy in a layer between the surface and about 200 metres deep. This is as deep as light can penetrate clean water. The temperature of the sea surface changes little between day and night. Day and night the air above the sea has much the same temperature. Some energy is lost from the sea in evaporation. It takes a long time to change the surface temperature of the sea and in turn the air above it. This is the situation that characterises southern hemisphere summer between October and March. The waters near the equator reach peak temperature at the end of southern hemisphere summer precisely because there is a lot of water warmed in southern hemisphere summer. Near the Equator there is a smaller peak at the end of northern hemisphere summer. The land is opaque. Between May and September the land heats the air above, water is evaporated and energy is transferred to the atmosphere as latent heat. The relative humidity of the air falls and cloud disappears allowing more radiation to reach the Earth. In a heated atmosphere, molecules of gas radiate energy in all directions. The energy state that forces molecules apart; creating a low density environment, is dissipated via decompression as the air rises. When local density falls to that in the immediate surrounds, convection ceases. In the absence of convection, molecules accept energy and pass it around like a game of ‘pass the parcel’. In northern hemisphere summer from May to September there is a lot of ‘passing the parcel’ because of the size of the land masses and the generality of the heating. So, there is a dramatic increase in outgoing long wave radiation as the cloud disappears and more energy from the sun is received (less is reflected). Because there is so much land in the northern hemisphere the Earth sheds energy almost as fast as it is received. Little energy is stored by comparison with southern summer. The atmosphere is generally well mixed. However one gas is actually created in situ and can only exist if there is an ongoing attack on the oxygen molecule by incoming short wave radiation. That gas is ozone. This gas needs a dry and cold environment because it is soluble in water. Ozone is present in higher concentration in the drier parts of the tropical atmosphere away from the inter-tropical convergence and in particular high up in the pressure cells that return air to the surface in the subtropics. At the tropopause OLR encounters ozone. Ozone strongly absorbs at 9.5um. This is very close to the median wave length of OLR from the Earth (10um). Ozone is the greenhouse gas ‘Par Excellence’ reacting strongly to outgoing long wave radiation and in turn radiating energy on all directions. There is a small amount of ozone below the tropopause but the concentration increases strongly at the tropopause and above. 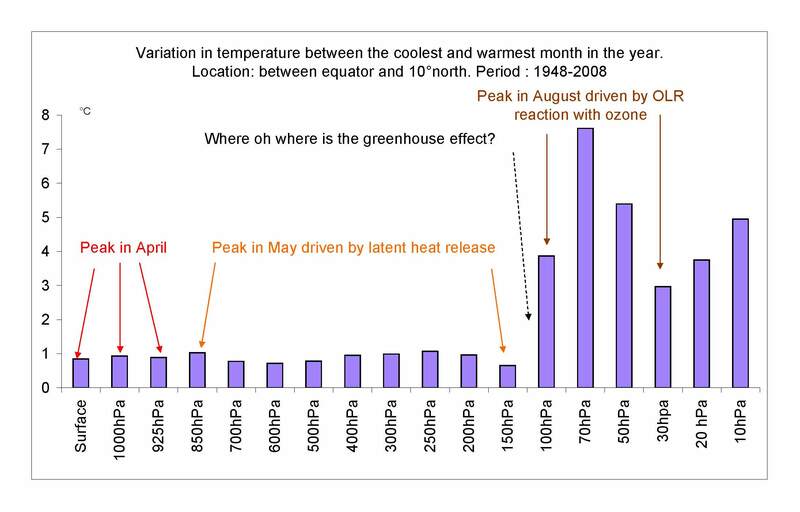 When ozone intercepts OLR there is a strong temperature increase and energy is radiated in all directions. 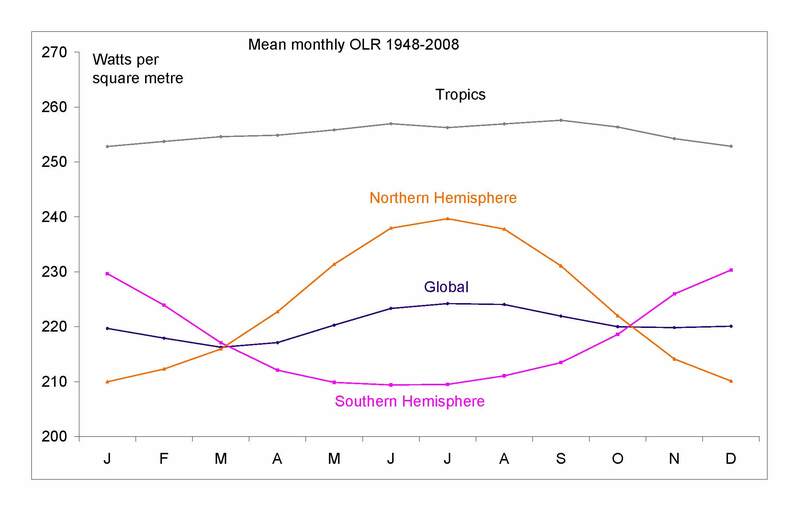 This excitation of ozone by OLR is ongoing in summer and winter but in the middle of the year there is much more OLR so the temperature response in the lower stratosphere is very strong. The effect of the consequent atmospheric warming and the resultant long wave radiation spreads as far as 50° south latitude where an August maximum temperature is maintained at 100hPa. We are told that outgoing long wave radiation is trapped by gases, notably carbon dioxide and water vapour, warming the atmosphere that in turn warms the surface. Fifty percent of the radiation is directed below the horizontal. It is maintained that this ‘down-welling radiation’ affects surface temperature. However the available temperature record does not support this proposition at all. 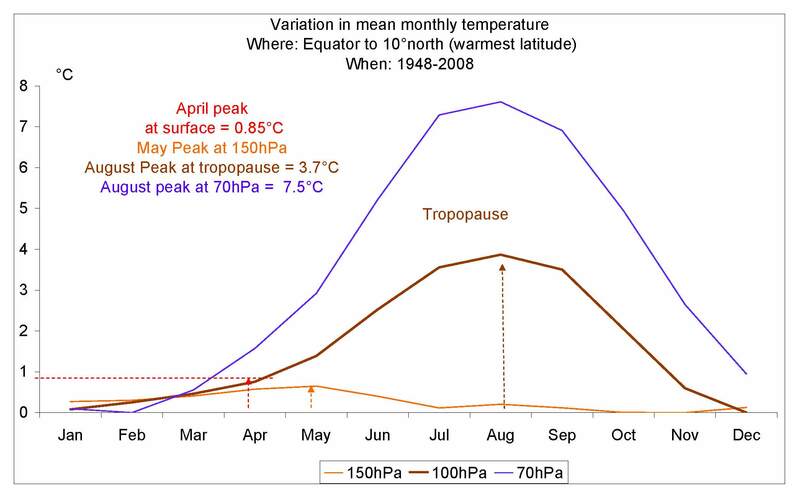 Consider figure 2 reporting mean monthly temperature in the troposphere between the Equator and 10°north. 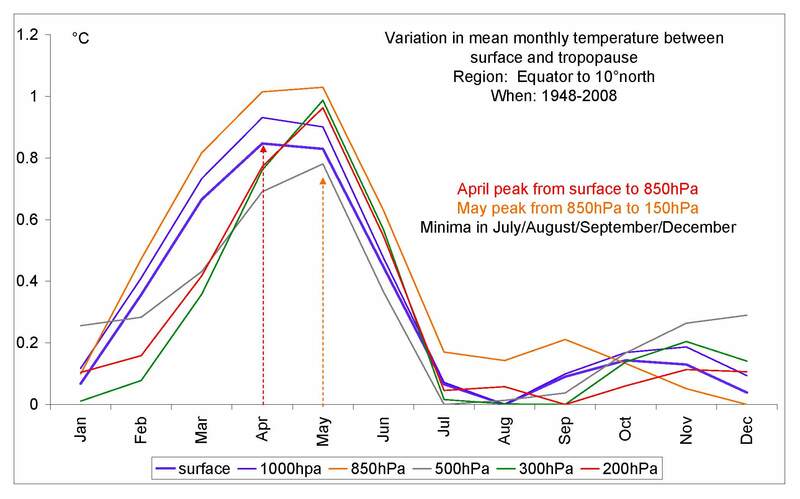 Here temperature peaks in April-May and again in November. Temperature is at its absolute minimum in August. The 850hPa level (top of dense cloud zone) is where the peak changes between April and May. Above the 850hPa the release of latent heat drives atmospheric temperature sustaining a May maximum all the way to the tropopause. Figure 3 shows a very strong August temperature peak at the tropopause (100hPa). The seasonal range in temperature at the surface is just 0.85°C. The annual range at 100hPa is four times as much and at 70hPa it is almost eight times as much as at the surface. Here is a case where down-welling radiation might be expected to influence the temperature beneath the warm zone. Figure 4 shows the difference between warmest and coolest monthly mean temperatures in the period January 1948 to October 2008. This statistic is the annual range of temperature. Notice that the most extreme variations occur in the lower stratosphere. In the stratosphere, convection is dampened by the slight increase in temperature with altitude. A body of air that is heated via the ozone reaction to OLR tends to sit and radiate its energy rather than be squeezed upwards by convectional processes. Though convection still occurs its vigour is attenuated. This must in part account for the strong and persistent temperature response to OLR in the lower stratosphere. Now, let’s review the variation in temperature from the surface upwards as shown in figure 4 and try to account for what we see. There is a gradual increase in variation between the surface and 850hPa (due to release of latent heat) declining variation between 850hPa and 600hPa (a dampening effect of the atmosphere on temperature variation), a slight increase in the variation up to 200hPa (an ozone response to UVB) but still with a tight peak in May just one month after the surface peak. Then there is a reduction in the extent of variation approaching 150hPa as the increasing ozone presence pushes up temperatures in mid year. Finally there is the four degree variation at 100hPa with that strong August peak. At 70hPa the difference between the coolest and warmest month is 8°C. It is apparent that convective activity below 100hPa prevents any heating effect from down-welling radiation. The cardinal difference between the troposphere and the stratosphere is in the strength of convection. The thermal relationship between 100hPa and 150hPa is a conclusive demonstration that the troposphere is unable to support heating via a process of down-welling radiation. Convection is stronger in the mid to lower troposphere than it is just below the tropopause where the lapse rate of temperature is affected by the ozone response to ultraviolet radiation. If convection cancels the down-welling effect at this level, with this temperature differential, it will certainly do so at lower levels where the stimulus is less and convection is more vigorous. The theoretical temperature of the Earth if (like the moon) it had no water and no atmosphere is calculated to be minus 18°C. Consider if you will the behaviour of air temperature in the arid zones far from the ocean. When the sun goes down the temperature plummets. What keeps the Earth warm is not the atmosphere; a thin vacuous and highly unstable film at best, but the ocean that covers 70% of its surface. As soon as the atmosphere is warmed, the affected parcel of air is driven upwards by the denser air that surrounds it. In a desert the warmth of the daytime is gone with the sun. The Earth is warmer than a hypothetical dry planet by about 32°C. This improvement is due to a ‘water bottle effect’ not a blanketing or ‘greenhouse’ effect. The greenhouse notion is unphysical. It ignores the defining property of the troposphere, convective transport of energy, sustained by a steep decline in temperature with altitude. ‘Tropos’ is Greek for ‘turning’ and the troposphere functions as a very effective heat exchange medium because, unlike the stratosphere, it is hopelessly unstable. The greenhouse theory ignores the gigantic absorber of solar energy, the oceans of this watery planet, and the cloud dynamics that determine whether energy storage in the ocean is increasing or decreasing. The secret to cloud dynamics lies in the upper troposphere where humidity varies little but temperature varies a lot, much more than at the surface. The agent of change in upper troposphere temperature is the sun. If we taught basic climatology in our schools rather than focussing on ‘social studies’ and ‘issues education’, children would be less susceptible to persuasion and more capable of maintaining a balanced viewpoint in relation to environmental issues. We are now dealing with a generation of ignoramuses in matters of this sort. It appears that a tragedy is about to unfold. Data: Kalnay, E. and Coauthors, 1996: The NCEP/NCAR Reanalysis 40-year Project. Bull. Amer. Meteor. Soc., 77, 437-471. I’ve always thought that a “heat storage” effect is what causes the planet to be warmer than it “should be,” according to the comparisons with the moon. And it appears to me that the “water bottle” effect amounts to the same thing. Thus, I tend to agree with your assessment. I would add, however, that “soggy” (always green) portions of the land surface act very similar to the oceans. Also, the same convective factors you mention for the humid areas are active in the deserts. The low-elevation deserts around 30 N & S latitude (aka, the “horse latitudes”) do not cool off all that much at night (about 7 C diurnal variation). Hi Jae, I agree with what you say about the soggy parts of the land. Agreed, the low latitude deserts rely on radiation and contact with the air to set up convection. Here in West Australia the diurnal range increases with distance from the sea. The critical part of the article from my point of view relates to the August maximum at the tropopause and the failure to shift the maximum from early in the year in the layers beneath. If the greenhouse theorem were correct we should see a gradual transition between the two as we move upwards in the atmosphere. That this does not occur demonstrates the superiority of convection over downward radiation from the warmed layer. What do you think of that reasoning? Agree. I don’t know whether you have followed the discussions about Ferenc Miskolczi’s theory on the Landshape blog (David Stockwell’s blog), but he also says that the heat is removed from the surface through non-radiative means (convection, latent heat). As soon as the temperature causes a steeper lapse rate, the atmosphere becomes unstable and convection occurs. Jae, The notion that heat is removed from the surface by radiative means completely ignores the role of water. Tropical waters vary very little in temperature. The flux in heat input/output can be seen only at 925hPa and at 850hPa where latent heat is released. There, the annual range in temperature is very much greater than at the surface. Radiation only picks up as a factor of importance when the atmosphere becomes thin enough to facilitate it…….which it surely does by 500hPa as shown by the drop in annual range of temperature as that elevation is approached. We have the evidence that radiation is very important at the tropopause (by definition convection ceases there) in the reaction of ozone to OLR, inverting the temperature curve in the southern tropics producing an August maximum. Any linking much appreciated. Its as good as a peer review in my book. Great to hear from you. Where do I find this blog by David Stockwell? It’s also on CA’s blogroll. I put the link to your post on the Forum, under the “Science” heading.